What if Jerry Maguire had used a customer relationship management (CRM) system? Let’s hop in the time machine as we go back to that infamous Tom Cruise movie. Remember how Tom—I mean Jerry—gets fired by Bob Sugar, and then both men run to their offices to secure as many clients as possible? Jerry starts his own firm with the one and only client he could save. After many months of “help me, help you,” his business finally gets its legs. Would CRM have made a difference? As the late, great, Dicky Fox said in the movie, “The key to this business is personal relationships.” Yes, CRM is good at tracking vast amounts of contacts and everyone’s interaction with them. And yes, CRM can help a good sales person like Jerry turn what would normally be “cold and corporate” into “warm and personal.” But what’s the business case behind warm and personal? Would CRM have been a wise purchase for Jerry’s old employer or for Jerry in his new startup? How can one measure the return on investment (ROI) from the purchase of a CRM system? The easiest place to start is in calculating the cost. Be sure to consider the following annual cost components for a new system (and current, if applicable)—fees for new licenses; maintenance fees on existing licenses; hardware purchase as well as maintenance and hosting costs; associated software costs (server operating systems, database licenses, etc. ); ongoing training; IT staffing costs; and any premiums on data import, new development, and upgrades. Also include one-time costs such as setup and configuration. Be sure to include all relevant applications. For example, if the company currently uses one application for CRM and another for email marketing, but the new CRM will replace both of these applications, then be sure to include that. If the firm has an existing system, calculating annual expenses for the current and proposed CRM will reveal amounts that, when multiplied by 5 years to represent a system’s life, might easily reveal the better value. 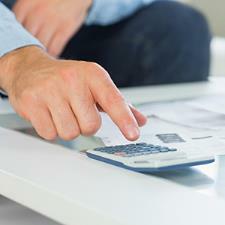 In calculating ROI, however, we must look not only at costs but also at potential gains. Begin with process improvements around a particular task. If the new system can shave x minutes off a task and those minutes cost $y in headcount with the task repeated z times annually, then multiplying these numbers will produce an annual savings that could be realized. Many CRM vendors tout enabling productivity improvements in the sales force of at least 30 percent. Multiply the company’s annual new sales by the number of sales reps, and this possible improvement percentage will provide an annual gain one can use, as well. A potential upside can also be found in other areas within the firm. Identify and analyze the burning issues in the company—specifically, in marketing, sales, and customer service. Look at customer churn rates, lead-to-close time, conversion rates, and other metrics in these areas. If a new system could improve any of those key performance indicators, what would it do to the company’s bottom line? Here’s a favorite question of mine: Could using the new CRM system result in at least one new client that we wouldn’t have closed had we not had it? How many of these new clients is it reasonable to assume? This could potentially be yet another number for the possible gain. Knowledge is an asset. Call notes, emails, activities, contacts on a customer’s site. . . it may not seem like critical information until it winds up in the wrong hands. What if after Jerry’s lunch with Bob Sugar—the one during which he’s fired—he had simply logged into the company’s CRM system through his smartphone and deleted all of his customers’ information from the company’s database? He then strolled away, having already downloaded all of this information into his own database. He hits a button, and an email goes out to all of these contacts announcing his new firm. In today’s world, that scenario is very much a possibility. What’s that potential liability worth to the bottom line? Having assembled all of this information, one can calculate the ROI percentage by subtracting the costs from the potential gain, and then dividing the result by the costs. One should also be able to calculate the payback period and a number of other investment metrics with the information gathered above, all of which will help form a solid business case for the new system or help the company decide if evaluating among several potential vendors. Chad Van Derrick has led scores of successful CRM implementations for global finance and professional services firms. He is managing director of Latitude 76, an international technology consulting firm that grows clients’ revenue through predictive technologies, and has consulted to such blue-chip companies as Fidelity Investments, Cushman & Wakefield, and IBM. He is a contributing writer to Studio B and tweets at @vanderrick.